A recent personal visit to South Africa gave our trustees Steve & John Bennett and Phil Newborough the chance to visit the school that we built with Pride ‘n Purpose in Newington Village in January 2015. It was great to see how the school has continued to develop since it opened. A great deal of colour has been added with lovely murals and painted windows, giving a real warmth to the classrooms. Desks, chairs and books are all in place, and there were plenty of activities to keep the pre-school age children that attend engaged. 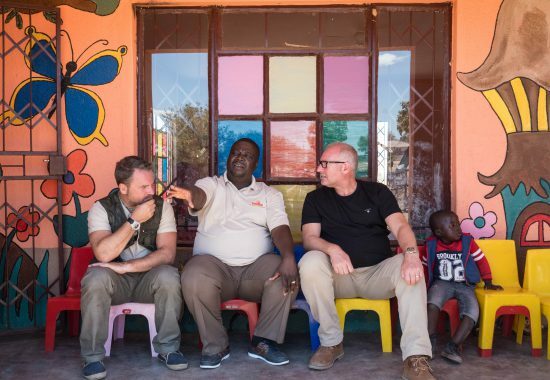 There’s always more than can be done, here Steve and Phil can be seen discussing with David from Pride ‘n Purpose his plans to install a bore hole, giving the school its own water supply.